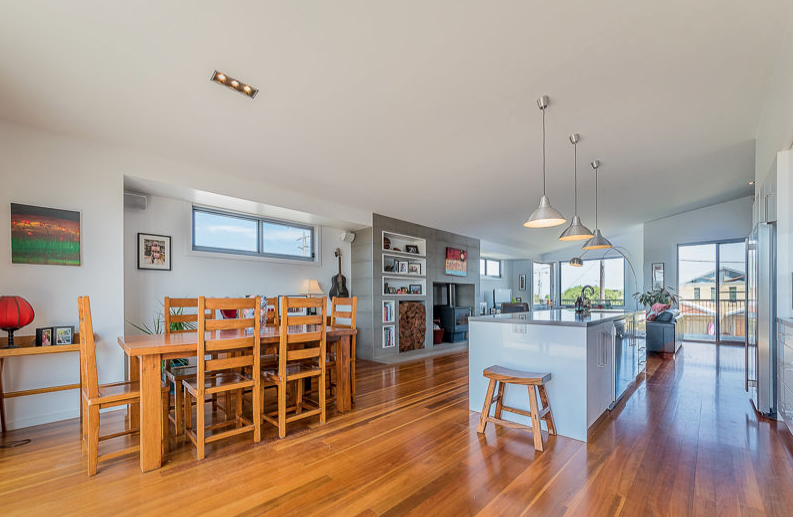 Our owners brief was they wanted a quality home that suited their close to ocean location, was comfortable for their growing family and friends and was robust enough for fit their active lifestyle. They got it right. Designed to make the most of its close water views, the top floor features a large light filled living space and central kitchen with polished spotted gum floors and an open fire place which adds to the room’s warmth and appeal. A master bedroom with water views, ensuite, powder room and an extra big bedroom with a loft, plus a big deck that overlooks a great back yard completes this level. Ground floor features 2 larger bedrooms, polished concrete floors to entry and a second living area plus a huge studio/music room that can easily double as a fifth bedroom. 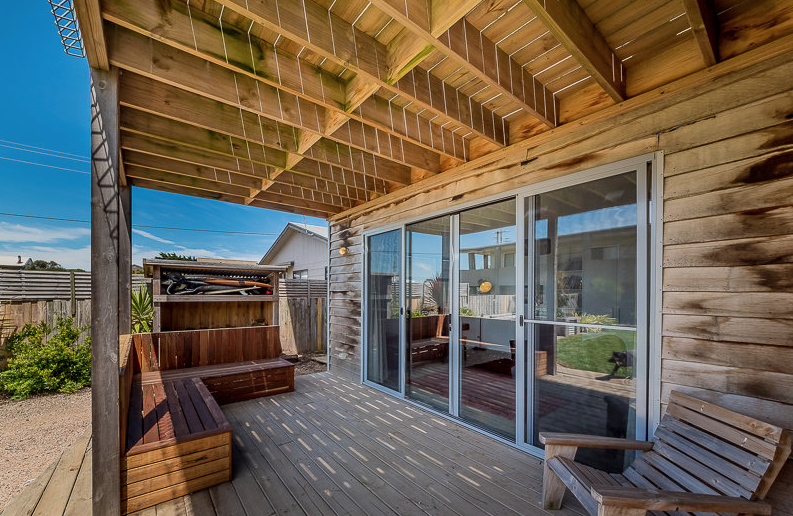 The home has a large tandem double garage with secure entry to the home, split system heating and cooling and an outdoor shower to rinse the sand off after a surf. The new release of the latest finishes from Laminex have arrived just in time for our own renovation. I love using materials which are raw and natural. The new finishes are really about bringing a wider range of colours and textures into homes which create a much more affordable and practical bathroom, kitchen or Laundry and robes. The possibilities give us much more to choose from. The two distinct trends coming from the European Kitchen shows are quiet different; one being natural colours textures and tones and the other being glossy and square crisp modern with pops of new colours. The Wood grain finishes and colours are rather lovely. If you are considering updating give us a call to discuss the possibilities. The weather is beginning to warm up. We can finally start to enjoy outdoor BBQ's and memorable gatherings with family and friends. That means its time to get the house ready. Are the decks secure and are the posts and pergolas safe? Do you need to spray for termites, strip decks back and reseal them? We can build or repair your deck, pergola, verandah and garden room and make it beautiful for the upcoming summer season. A new deck can add a fantastic outdoor living space not to mention add value to your home. We recommend using Australian Timber that is sourced from a reputable and sustainable supplier. For more on responsible Timber Sources visit Ecospecifier Real Timber is beautiful. Not only do timber decks look amazing they feel gorgeous underfoot and stand the test of time. Our local Timber Outlet in Cowes TJ's has a fantastic range of boards and can also source Landscape timber for that added Wow! Factor. There are Local laws governing what can and can't be built and we can advise you on what the requirements are. We can give you design ideas and make you backyard and outdoor room spectacular. Remember only use a fully registered and Insured Builder like us that understands local laws, permits and can offer full warranty protection. All work over the $5000 mark should only be carried out by a registered builder and have a contract in place to protect you. Visit www.consumer.vic.gov.au for more information. Thinking of going Owner Builder....you may want to rethink that! Thinking of building as an owner-builder? With owner-building continuing to be a popular option among homeowners, it’s essential that tradespeople and practitioners and the public are aware of their obligations when it comes to carrying out work as owner-builders. For further information on owner-builder requirements visit the VBA website. A close collaboration between the owner’s son – an aeronautical engineer and property developer along with builder Ashley Johnson from A & J Johnson Construction has lead to a rather impressive house on Phillip Island that meets the high bushfire protection required of the site. Mature trees on the site, originally planted by the owners who didn’t want to cut them down, meant a tight building envelope and a BAL40 rating for the house. Builder Ashley Johnson, who drew up the working drawings of the house, describes it as a shoe box with a lid. But the house is much more than a shoe box with a lid on it – an entire wall is made up of windows. “We had to find windows that met BAL40 as some of the windows were up to 12m long and we had big sliding doors as well. Almost the entire north face of the living room and swimming pool is glass,” Johnson says. Windows were specified from Eurowindows, who actually had their windows tested to bring the ratings up to BAL40 for use in the Phillip Island house. Large eaves – some up to 2m wide – around the house block the summer sun, but let winter sun in. Tracking of the sun was figured out so as to incorporate passive heating into the design of the house. Cladding on the house was rendered Practica MMC’s K Series. This was chosen to meet the light-weight solution needed due to the parapet wall, it could be rendered and it met the BAL40 requirements. Lengths of the building were also too long to use something like cement sheeting, as the owners didn’t want to see joins in the facade. Two different renders from Dulux were colour matched for use on the house, which blend well with the bushland setting. Additionally, the house meets the minimum 6-Star Green Star rating required of new builds in Victoria, but Johnson says it far exceeds that as every product was upgraded on the minimum requirement. The Phillip Island house not only meets the BAL40 requirement of a bushfire zone, but it is a truly sustainable, bespoke house. The K-Series from Practica MMC is a weather-tight cladding system designed for the extreme conditions found in Australia. It features a Kooltherm insulation panel, a breathable weather wrap for frame protection and a unique flashing and sealant system for weather proofing. It is CodeMark Accredited to comply with the Building Code of Australia. Achieving the Bushfire Attack Level of BAL40 means the K-Series is extremely fire resistant and suitable for use in Bushfire Zone construction. The K-Series allows a lot of design freedom as any timber frame can be clad in the system and completed with a modern render finish. In order to achieve the BAL40 rating, products need to pass the rigorous AS1530.8 fire test. Practica MMC technical manager Bent Pointon explains this process, where the full K-Series wall system, including render, is placed in front of a radiant heat source for a flashover bushfire test. Once the heat test is complete – it lasts for 10 minutes – the wall is then monitored for the remaining hour to ensure no flare-ups occur. The final result ensures the timber frame and interior wall system remains untouched by the outside flames. This provides some peace-of-mind for a home owners’ asset and possessions, Pointon says. Additionally the K-Series is a continuous external insulation system with no breaks in the building envelope. This super high thermal performance – R6.7 for the total wall system with batts – helps achieve the minimum 6 star energy ratings required of homes. We have just viewed the new Cesarstone Colours which are due for release in June 2015. The new colours are really fantastic representations of concrete in a salt white and wet concrete choice and the other is a user friendly and sophisticated Marble style finish Statuario Nuvo. These finishes will suit both contemporary and traditional homes and really do represent some stunning choices. Ceasarstone is a very practical surface choice for Kitchens, Bathrooms and Laundries. They add a real sense of quality to new homes and renovations. To view the full range of choices visit Ceasarstone for more details and order samples.